If you like crunchy snacks, carrots might be the perfect treat that is relatively low in calories and easy to pack. Carrots also can add color and valuable vitamins and nutrients to a variety of salads, soups, stews, and side dishes. Although they are a root vegetable. they are not as high in carbohydrates as many starchy root vegetables. Carrots are smart vegetables to keep in your kitchen. Carrots are high in fiber and a single medium carrot contains only 25 calories. But calories in carrots can add up quickly if you add dip and eat them mindlessly. There are 6 grams of carbs per medium carrot and 3 grams of sugar, more than many other vegetables. 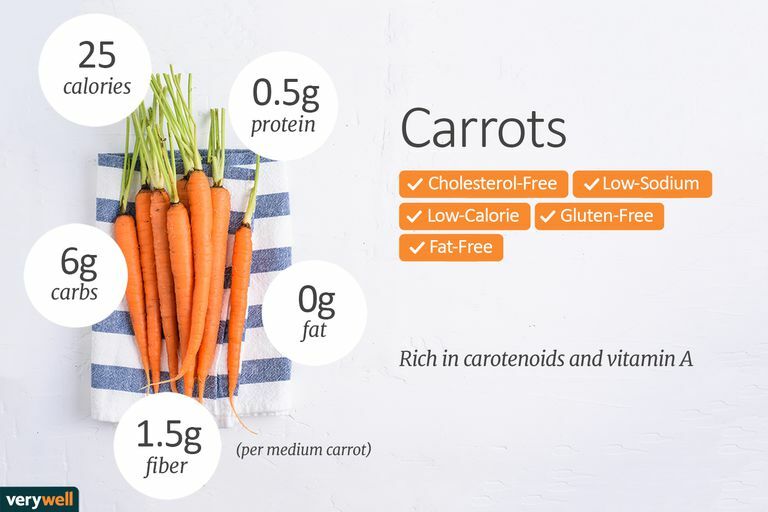 But carrots also provide 1.5 grams of fiber, so you'll only get 4.5 net carbs per carrot. There has been contradictory information over the years about the glycemic index (GI) of carrots, which is an indicator of how much and how fast a food raises blood sugar. One older study, thought to be of cooked carrots, showed a high glycemic index of 92, which is nearly that of sugar. But another study of cooked carrots showed a glycemic index of 33, which is moderate, and the Mayo Clinic notes that raw carrots have a glycemic index of 35. The international tables of glycemic index and glycemic load show boiled carrots to have a glycemic index of 39, which is the currently accepted value. Raw carrots probably have a lower glycemic index than cooked carrots. The glycemic load takes the serving size of a food into account as well. A glycemic load of less than 10 is thought to have little effect on blood glucose response. The glycemic load of carrots is thought to be 1 for a 1/2 cup serving of raw carrots and 2 for a 1/2 cup serving of cooked carrots. If you're trying to lose weight by cutting carbs, you might skip carrots because they are higher in sugar than other snack veggies. But if you compare the 3 grams of sugar in a medium carrot to a fruit snack like a banana, orange or apple, which each contain 20 to 30 grams of sugar, then the carrots don’t look so bad. If you’re worried about the sugar in carrots, mix your vegetable snack bag with other crunchy snacks like celery or broccoli. That way you get to indulge in a crunchy treat without derailing your diet. Carrots only have a trace amount of polyunsaturated fat. A medium carrot has 70 milligrams of omega-6 fatty acids and 1 milligram of omega-3 fatty acids. There is only a tiny amount of protein in carrots. A medium carrot would provide only 1 percent of your daily protein needs. You will need to balance your diet with other foods that provide enough protein, such as legumes, nuts, dairy, meat, and fish. Carrots are an excellent source of vitamin A. You can get your entire day's needs from a quarter cup of grated carrots or an ounce of carrots. Vitamin A is essential for vision and helps the body with cell growth, immune function, reproduction, and healthy communication between your cells. Carrots are a good source of thiamin, niacin, vitamin B6, folate, and manganese. In addition, carrots are a very good source of dietary fiber (great for digestive health), vitamin C, vitamin K, and potassium. Carotenoids are named after carrots and give plants their yellow, orange, and red colors. There are many different carotenoids and some provide the building blocks for vitamin A. Others, including lutein, are used by the eye to absorb blue light and maintain visual function. This is why your mother probably told you to eat your carrots to help you see better. Many carotenoids are antioxidants. A diet high in carotenoids has been associated with decreasing your risk of heart disease and some cancers. Getting carotenoids from whole foods, such as carrots, is a better option than using dietary supplements, according to researchers. Purple carrots may represent the heirloom carrots cultivated hundreds of years ago before they were bred by Dutch farmers to be the orange color commonly seen today. Purple carrots get their color from anthocyanin flavonoid pigments, as do blackberries and other purple fruits and vegetables. Purple carrots have more lutein while orange carrots have more beta-carotene. Both of these are probably beneficial to health. Lutein and anthocyanin are involved in eye health, and purple carrots are higher in antioxidants. If you are looking for those benefits, you may want to add purple carrots to your diet. Are carrots with the tops on fresher? Most experts recommend that you buy carrots with the tops still attached for optimal freshness. But these are not available everywhere and not everyone has the time to cut and prepare carrots at home. Baby carrots are simply smaller carrots that are cut from larger carrots. Baby carrots are usually already washed and cleaned so you can eat them right from the bag, making them a convenient and healthy snack. Carrot food allergies are rare. However, if you have hay fever you may have a pollen-allergy food syndrome and cross-react to proteins in carrots that are similar to the pollen. If you are allergic to birch pollen, you experience this reaction when you eat carrots. You might feel a tingling or itch in your mouth after eating carrots. In rare cases, this can be more serious and trigger throat swelling or anaphylaxis. Donaldson, MS. A Carotenoid Health Index Based on Plasma Carotenoid and Health Outcomes. Nutrients. 2011 Dec. 3(12): 1003-1022. Higdon J, Drake V, Delage B. Glycemic Index and Glycemic Load. Linus Pauling Institute, Oregon State University. 2016. http://lpi.oregonstate.edu/mic/food-beverages/glycemic-index-glycemic-load. Mayo Clinic Staff. Glycemic Index Diet: What's Behind the Claims. Mayo Foundation for Medical Education and Research. https://www.mayoclinic.org/healthy-lifestyle/nutrition-and-healthy-eating/in-depth/glycemic-index-diet/art-20048478. USDA Food Composition Database. USDA. https://ndb.nal.usda.gov/ndb/.